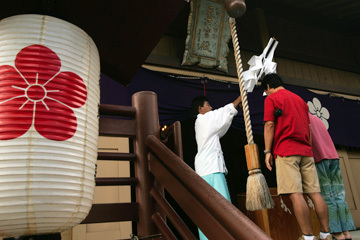 Hundreds of people gathered yesterday morning at the Hawaii Kotohira Jinsha-Hawaii Dazaifu Tenmangu in Kalihi to receive traditional Japanese New Year's blessings for prosperity and success. Hawaii Kai residents Wiktor and Yuki Bulaj received a blessing in front of the Kotohira Shrine from Jennifer Ota, right, and Brooke Hasegawa. It was the couple's first visit to this temple. The shrine's Rev. 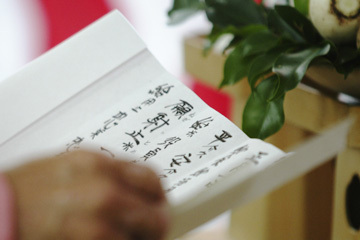 Masa Takizawa read a prayer in Japanese. 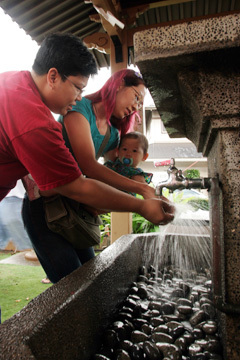 Kalihi residents Miles and Chelsea Calunod and their 1 1/2-year-old daughter, Serra, washed their hands, symbolic of purification. 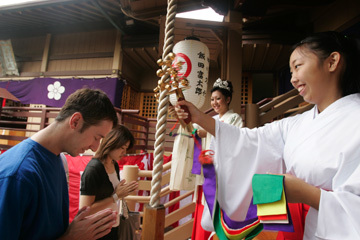 Tasung Yasu Yang and Aiko Shiono received a blessing from Hiroshi Yamaji in front of the Dazaifu shrine. 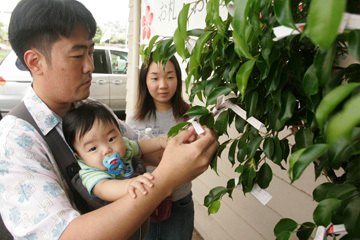 Steven and Nobue Yoshida of Kapahulu and their 7-month-old son, Nathan, tied an Omikuji, or paper fortune, to a tree as a way of leaving their misfortunes at the shrine. 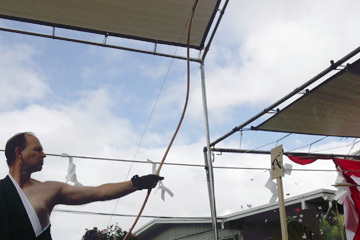 Sensei Rick Beal of the Nanka Kyudo Kai in Pasadena, Calif., performed the traditional Yumi Hajime with a Japanese bow and arrow. It was the first time the "first draw of the New Year" ritual was conducted here.